This extension utilizes Yii's built-in Database Authorization Manager (CDbAuthManager) to provide a web interface for advanced access control. Follow the link below to try Rights on the Yii Blog demo. Please contact me if it doesn't work or seems messed up and I will fix it as soon as possible. Rights is currently translated into Finnish, French, German, Greek, Hungarian, Italian, Japanese, Spanish, Simplified Chinese and Swedish. Please contact me if you wish to translate Rights. Configuration parameter for the application layout. Fixed a somewhat critical bug in the installer which cased the installer to not run correctly. Thanx for a very interesting extension! I have found one bug - empty permissions generate foreach error but it's not very important. I have a problem with translation files too. I set up 'sourceLanguage' => 'pl_pl', created directory 'plpl' under messages folder (with Polish translation but without effect. Still english ...Any ideas? I installed 0.9.8 without any problem. Worked immediately, including the automatic generation of authorization items. I suggest to upgrade getAuthItemsByNames function by selecting all names with one query and saving the results to array, than every time when you call function getAuthItemsByNames you can check the array for selected name. Because now you must select a very hard query on each check. * Rights authorization manager class file. * Implements support for sorting of authorization items. * @var string the name of the table storing authorization items. Defaults to 'AuthItem'. * @var string the name of the table storing authorization item hierarchy. Defaults to 'AuthItemChild'. * @var string the name of the table storing authorization item assignments. Defaults to 'AuthAssignment'. * the item doesn't already have this child. * @throws CException if either parent or child doesn't exist or if a loop has been detected. * the user doesn't already have this assignment. * for this particular authorization item. * @return CAuthAssignment the authorization assignment information. * @throws CException if the item does not exist or if the item has already been assigned to the user. * Returns the authorization item with the specified name. * @return CAuthItem the authorization item. Null if the item cannot be found. * Returns the authorization items of the specific type and user. * meaning returning all items regardless of their type. * they are not assigned to a user. * @param CAuthItem the authorization item the items belong to. * @param boolean whether to sort the items according to their weights. * @return array the authorization items of the specific type. * Returns the children of the specified item. * @param mixed the parent item name. This can be either a string or an array. * The latter represents a list of item names (available since version 1.0.5). * Returns the specified authorization items sorted by weights. * @param array the names of the authorization items to get. * @return array the authorization items. * Processes the authorization items before returning them. * @return the processed authorization items. * Updates the authorization items weight. * @param array the result returned from jui-sortable. Along with general Extension update do official release 1.0.0, author of this extension has also updated documentation for it. Complete documentation for version 1.0.0 can be downloaded here: http://yii-rights.googlecode.com/files/yii-rights-doc.1.0.0.pdf. Just to clarify, the previous comment does not describe an actual bug in this module. A fresh checkout from svn to another web server environment, and the problem no longer exists. Obviously, the issue was a result of a strange environment quirk. No worries. Fantastic module! I recommend it to anyone that needs a quick, intuitive way to apply RBAC to a Yii application! Where can I find the sample database for the sample blog? Is it included there? whats the matter with "stdClass::user->isGuest not defined"
i have installed the rights. but when i request it, it always shows me the error , "undefined variable: stdClass::user->isGuest",whats the problem？，my apache config? or php config? or the application config? help me ,3ks a lot! In assignments screen (/rights/assignment/view), the table header shows "Name" for the user name. It could be made more clear by using the text "User Name". It seems there isn't support table_prefix.So if I have many projects to use only one database.rights mey be confused.table_prefix needed! I don't know why .may be it's the bug of blog.Can somebody test and help me out? Hi, if it a bugs? "There must be at least one superuser!" Note: In case your User model is not called ‘User’ or if you user name column is not called ‘username’ or if your user id column is not called ‘id’ you need to override the respective setting in the module configuration. You'll also have to import your User class, e.g. if it's in a module. I think exporting/importing Roles/Operations/Tasks would be a great tool to make it easier to manage roles etc. across code updates. Here is my simple example to allow only the owner of an blog post to view, update and delete. In my example Post has a propery 'user_id' which is the value of the owning user. Seems to check for user even when "install" is true and you're logged in. > ERROR: code=403, message=There must be at least one superuser! Then install it, then uncomment, it works just fine. @horizons $userIdList is an array that holds the ids of the users with superuser access, so the current condition is the right one. @paejan I'm currently using Rights with Yii 1.18 and it works without a hitch. I tested the rights module with the yii 1.8 blog demo and forgot that the UserIdentity returns the "username" for Yii::app()->user->getId(). because the blog demo has only an array for authenticate. Guess this is the problem which others also have if they install the rights module in their "test applications". i found this after i tried to add the "admin" superuser role to another account. which failed every time. So it works with yii 1.8 it just doesn't work from scratch in the yii blog demo cause of the missing user data. Just started using this module and like it... moving from srbac. It would be nice to change the drop-down list for assigning operations to tasks to a multi-select list box. Then you'd have the ability to select multiple operations for one task and click Add just once. Wow man. Rights totally deserves that. Congratulations! You can add the multiselect by themeing. Such a good module, Thank you very much! The only problem is that it's very difficult to find it through Google. Better than any other Yii RBAC manager! Rights module generates rights only for controllers/admin/PageController.php? So, currently Rights module doesnt support not uniqiue names for controllers? Has anyone same problem? How to fix it? OR your actions name must be unique for the same controller name. There is no better solution without hacking rights. I am going with number 2 and for small project it is fine. great job really love it! i am working with framework yii-1.1.9.r3527, with no additional plugins installed..
on the first run needed to add an entry in the authitem and authassignment db tables. now its working perfectly, the documentation is missing these stuff! Hopefully, it's just me being dum. I've created Roles, Tasks and Operations, its working! first login it would say "There must be at least one superuser!" The development of this extension has been abandoned? Thanks a lot for all your hard work Chris! I am having a problem where when not logged in, a guest can type the url of a page in the browser and it will go there. Anyone know what I might be doing wrong? Errr nevermind, I figured it out. I wasn't extending my controllers from RController and adding the filter. Thanks anyway and maybe this will help someone. I think it just lacks some documentation on how to use business rules and data on tasks. Could you explain and illustrate? User model with a column called 'name' causes some trouble. When there is a column called 'name' in the User model's table, you may come accross some unexeptected problems getting access as superuser. You have to modify Rights a bit to get this working. See: Yii-rights Issue 71: problem with column named "name" on code.google.com for one possible solution. // Allow superusers access implicitly and do CWebUser::checkAccess for others. It was very useful for me. Hope it to be for you too. CPhpAuthManager and its behaviors do not have a method or closure named "getAssignmentsByItemName". their is no CPhpAutmManager while getAssignmentByItemName is in RDbAuthManager.php. Please help me. How to install this extension. Next code is solved problem, but it's very bad.. When generating permission for conroller, rights module does not see empty controllers. But this controllers may content some inherited actions (for example class PostController extends CRUDController). How to perform access for non super-users in this case? I want to search users or want to search user with particular permission,Want serch above,like in gridview of admin page,tell me,how I can achieve it. I want search opton in it,as we getting in admin page -gridvew,can u please tell me,how I can achieve it. doesn't seem to be checking access recursively. Let me (try to) explain. I have 2 roles R1 and R2, and I want to perform action A. Assume R1 is a child of R2. Assume A is a child of R1. In the 'Permissions' page of the module, in (column R1, row A), I read 'Revoke' (wich means that A is assigned to R1). And in (column R2, row A), I read 'Inherited *' (wich means that A can be accessed via R1 by R2). Now I log in with user U1 which has role R1. U1 can indeed perform action A, no problem. Best RBAC manager I've ever used..needs support and documentation though.. I've had a very good experience with Rights, as I used it in a very user role based projects, and got chance to dig into into it quite often..
What I felt most was that things are not documented properly, so I've written a small blog about small things one can so which are required often..
"My blog post about Rights"
Assigning actions to roles becomes rather tedious when you start having 10+ roles. Is there a way to make that part of the interface cleaner? P.S. : it isn't really specific to the rights-extension but i really don't see any reason for anyone to roll their own rbac when there's cniskas version. there is not a way to set the accessRules for static pages (created with CViewAction), for instance if I want to allow access to my static pages only for authenticated users. The normal accessRules let me to specify an action but not a view. We needed checkAccess() to return true when the user has permission for "Foo. *" and the check is called with "Foo.bar", when not AuthItem exists for "Foo.bar". You can easily change it to always fallback (no matter whether the operation AuthItem exists for other roles), when you remove the inner item check. If you have any ideas/suggestions, please tell me. hi, I do all muy homework. there is some data that should be in new tables ? It's been a while since I've been working on Rights. After the success of my Twitter Bootstrap extension I decided that it was time to develop a new module for permissions management using bootstrap. I've been working on my Auth extension, which is a modern and responsive user interface for Yii's authorization manager and it was released yesterday. If you liked Rights, I'm sure that you will feel at home using Auth as well. It fixes some of the core problems in Rights and is both easier to use and extend. There is also a demo available. What is the current core problems with Rights? Thank you for developing Rights module. Can you tell me more about the current core problems with Rights? I used rights within my cms and it will be great if you can tell me the current core problems of Rights. I will do my best to implement it. Thank you once again for Rights module. Sometimes when I left my page opened for 30 minutes or when I open the site after some hours, I have this error. I've just uploaded this extension, which provides methods to ensure compatibility for rights and yii-user. Solution Found but modification needed by the development team of this extension. I am giving rights for 'create' to the 'authenticated' but the 'guest' also get the same right.Means the extension does not undersatnd any difference between 'authenticated' and the 'guest' please help me . I am dying. :( "
Well I found the answer after discussing this with my senior. Well the problem is that as long as the "authenticated" role will be there there will not be any difference between the guest and the authenticated. you will have to change the name of the role "authenticated" to something else such as "registered" or anything else that you want. Well this may be considered as a bug. @property string the name of the guest role. how a guest name can be assigned as 'Authenticated'? I think here lies some problem. So conclusion is that you must change the name of the authenticated role to something else for the smooth operation. There must be at least one superuser! Hi, I still get this error when tryint to install Rights. Should I drop Auth* tables before triying again ? the installer create a row in authassignment table, but the value for userid is "admin" and in my case, User table id value is "1". Any idea why getUser->id return "admin" and not "1" ?? Property "RDbAuthManager.authitemTable" is not defined. I have a this bug, can someone help me? (That's from a print_r(Rights::getAssignedRoles())) That's not terribly useful, at least to me. In my system, each user is assigned one and only one role, and the set of roles includes more than just Guest, Admin, and Authenticated. How can I access the role assigned to the user? hello! I'm trying to install the "rights", but is returning the error, as image below. My question is: is he looking for the model "Users" because it is based on the blog? Can I change this model into another of my choice? which is your User class/model? How do I get this superuser working, I thought he would be installed automatically. which is your user class? add a column named superuser and make it 1 for admin. this is a tricky way. Right Module login from two tables ,but keep functionality. In one of yii project installed yii right module and for login there is used a blog_user table,there is another table for students,Now I want to login with students table records but keep the yii right module functionality , How it is possible that both can login blog_user and students? use one table for login. that is better. relate students with user table. use user role to differentiate!! dont get complicated! So, I must insert to DB manually. authassignment->Admin,id user to make as superuser,NULL,"N;"
here 'clients' is the role name and '$model->id' is the user id. Many packages are just created from the GitHub API. how to assign permissions in yii rights module automatically when a user registered? See using business rules in the guide. The example with authenticated should come close to what you need. From the above example 'clients' is a role name. So create roles according to your preference and assign dynamically at the time of user creation . '$model->id' is the user id. you can also assign any authitem like this other than role. I need to assign permission at the time of user creation,Like controller/action. I assigned a Role to user now When user after login when go to controller/action(user/profile) its show a error you are not authorized to perform this action. but when I go to rights module and assign this permission controller/action to this user,it is working, How I can add permission for this user automatically? check the role and assigned operations/tasks. also check the user for the role. can i use it any commercial project of me? i have post model and according its crud. example with image or web is good for me. How can I change the default url? I need to order the gridview by name and description in operations's view. Upgraded version for Yii 2.0? I love this extension and thinking to use in my current project. However, I would like to confirm some doubts. 1) Is this extension still maintained? 2) Is it going to be upgraded for Yii 2.0? @b3atb0x, tried to add the following to my composer file "Webkadabra/yii-rights":"dev-master" but it says your package is not found, what do I add to composer to get your version to install? No. we cant directly upgrade a yii 1.x application to yii 2.0 . Please merge this into the main distribution. Where you got that error? one question about rights and user! 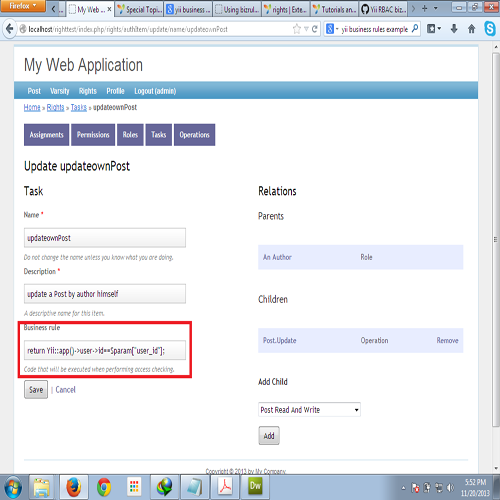 I have followed this tutorial http://www.yiiframework.com/wiki/423/installing-yii-users-and-rights-to-newly-created-yii-app/ to install them. All fine, i can log with admin and set the rights. And now if i open the page without logging me he redirect me to the login page! I set all the permission for the guest, so this is not what i want! Even, i set the permission from this page r=rights/authItem/permissions. In my idea the item Site. is a global item that have inside him Site.Contact, Site.Error and Site.Index. It's right? So i can set only the Site., right? Last question, when i read Revoke it's mean that the guest have the permission and when i read Assign it's mean that the guest have not the permission, right? I have check in the db table and i can see the item in the table when i read Revoke. Is someone going to update this great extension? Hi! The domain (http://www.cniska.net/) is not working!!! Please try a rewrite . Hi , Is there a separate version for Mongo DB. Current module Scan all the member function which starts with keyword "action" from almost all the controller. 2) Can we add more keywords? Most of my functions starts with check and not action. So can have both options ( 'actionEditUser' + 'checkEditUser')? 3) Can we include some plugin/extensions/components and create its operations? Add controller action option is there . Try that functionality. Where you got this error, I am working with Rights, no issues here.